This item is expected to ship 4-6 weeks after the event on July 10, 2019. The impact of trauma is so profound that it is felt not just in the mind, but in the body as well. Survivors carry the effects of the traumatic events in their tissues, negatively affecting their ability to rest, to remember and process, and to achieve a state of regulation. To successfully work with these clients, you need to utilize embodied practices that incorporate mind-body connection into your clinical practice. Mounting evidence points to yoga as a complimentary tool that you need in your arsenal to effectively work with trauma survivors. Michele Ribeiro has been using yoga and mindfulness with trauma survivors for over 20 years, and she wants to show you how to reenergize your own work. 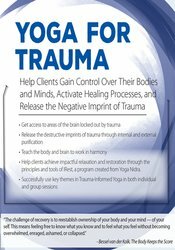 Find out how simple yoga poses and techniques can be introduced to help clients become aware of and then remove traumatic imprints through mind-body purifying processes. Teach clients how to send revitalizing, healing energy throughout their body. Discover the benefits of Yoga Nidra and how to help clients reach this state of relaxation and restoration. This recording is your “how-to” guide for incorporating evidence-based yoga poses and techniques into your practice in a manner that is effective, ethical, and appropriate for your scope of practice. You do not have to be a yoga therapist to apply what is learned in this recording to your own trauma work. You only need to have a desire to see transforming healing occur in the lives of your clients. Explain why embodiment in psychotherapy matters and how to incorporate it successfully into treatment with traumatized clients. Determine effective ways to help trauma clients focus their perception and mind on what is happening in the body as a result of the trauma. Evaluate trauma’s effects on the brain and how to use yoga to mitigate them. Apply Yoga Nidra and iRest scripts to help trauma clients achieve impactful states of relaxation and restoration. Utilize the key themes of trauma-informed yoga appropriately in both individual and group sessions. Practice various yoga postures and movements, including chair-focused trauma yoga, in preparation to use them in sessions with clients. Michele D. Ribeiro, EdD, CGP, is a Licensed Psychologist, Certified Group Psychotherapist, Certified Yoga Instructor and a Children/Teens Meditation Course Teacher. She has been applying mindful awareness as a therapist and teaching mindfulness as a skill to clients presenting with depression, anxiety, ADHD, trauma, eating disorders and addiction issues for over 20 years. Dr. Ribeiro began her yoga studies in 1997 and completed advanced yoga training in India at numerous yoga centers and ashrams including the Indian Yoga Institute, Prashanti Kuteeram in Bangalore, the Yoga Study Center in Rishikesh, the Ramamani Iyengar Memorial Yoga Institute in Pune, India and at the Iyengar Yoga Center of New York in NYC. She has written on mindfulness for the "Group Psychologist Newsletter" and assisted with editing journal articles on yoga and ALS in the Journal of Alternative and Complementary Medicine. Dr. Ribeiro has a private consulting practice, works as a psychologist and instructor at Oregon State University and is co-owner of the Iyengar Yoga Center of the Willamette Valley in Corvallis, OR. She has taught yoga, mindfulness practices, and biofeedback at various universities, schools, and conferences throughout the United States and abroad while working as a psychologist for Semester at Sea. She serves on the planning committee to create a new Yoga Certification Program, is on the steering committee for expanding Contemplative Studies and is co-leading the development of a new Mindful Living and Learning Community all at Oregon State University. Financial: Michele Ribeiro is in private practice. She receives a speaking honorarium from PESI, Inc. Non-financial: Michele Ribeiro is a member of the American Group Psychotherapy Association.